How to make Kumkum powder at home? 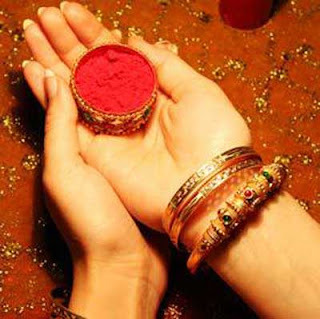 Kumkum is a red powder applied on forehead and on the parting of hair by Hindu women. It is easy to make Kumkum at home provided if you have the right ingredients available. Here is a brief idea on how to make kumkum at home. Turmeric – Gather original turmeric. Boil it and then dry it in sun. Slaked lime – a caustic substance produced by heating limestone. Powder the turmeric very well. Mix it with slaked lime. Add water. You will get a bright red color. Don’t make it too watery. Make sure that you mix all well. There should not be any small pieces in the mix. Make a lump like small chapathi or poori ball. Once dried break it and powder it again. You will get Kumkum.